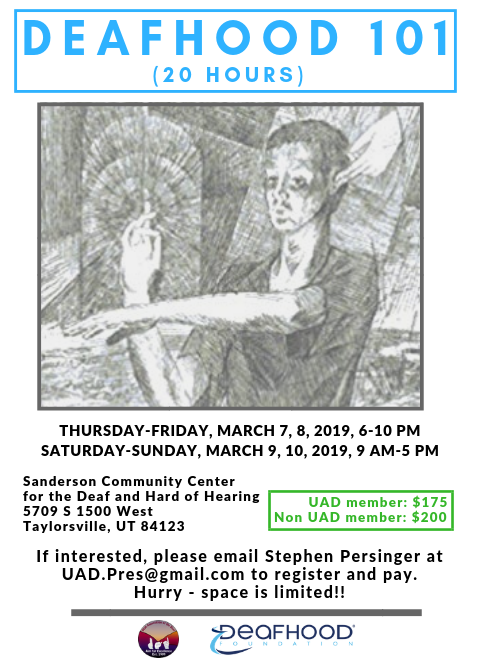 UAD is very thrilled to announce that we are hosting another DEAFHOOD 101! This will be at Sanderson Center- 5709 S 1500 W. Taylorsville, UT 84123. You MUST REGISTER FIRST to be able to attend. Hurry now and register NOW since space is limited. If interested, please email Stephen Persinger at UAD.Pres@gmail.com to register and pay. The flyer for this is also attached here. UAD Announce is a public service provided by the Utah Association for the Deaf. It provides information to the deaf and hard of hearing community on whatever is of interest to the community. The Utah Association for the Deaf does not endorse announcements posted on this list, and takes no responsibility for errors. The UAD moderators do not answer questions nor respond to comments.